The Short- With a cast this brilliantly constructed it is shocking that neither Shawn Levy or Author/Screenwriter Jonathon Tropper could find enough substance in a very makeable movie. The dialogue is punch less and predicable taking away from a nice cast and interesting characters. The biggest failure in This Is Where I Leave You is that with all this talent onscreen it never blows you away. It never gets close to being a memorable movie; instead it comes off as a film made to sell tickets thanks to its talent and nothing more. Every year you get movies that you weren’t expecting to blow you away that have you thinking, and talking about them long after the credits roll. Sadly director Shawn Levy’s adaptation of This Is Where I Leave You is not one of those films. Even with a script adapted by the author of the novel Jonathan Tropper it is nothing more than a sideshow to show off its talented cast. This Is Where I Leave You is about Judd Altman(Jason Bateman) who is having about the worst month of his life, he just caught his wife(Abigail Spencer) sleeping with his tough guy boss (Dax Shepard) and weeks later finds out his father has passed away. He is then forced to rush home to help bury his father, whose final dying request was for the family to spend the next 7 days under the same roof together. We come to find out that the Altman family is a lot more screwed up then Judd’s most recent issues. Judd’s sister Wendy (Tina Fey) is stuck in a loveless marriage with two children and a former flame from her past is always present, Judd’s eldest brother Paul (The Strain’s Corey Stoll) can’t conceive with his wife Alice (Kathryn Hahn), and younger brother/ man child Phillip (Adam Driver) hasn’t quite grown up yet. The Altman’s have issues and the film sets up the opportunity for these issues to get resolved….only some of them do. 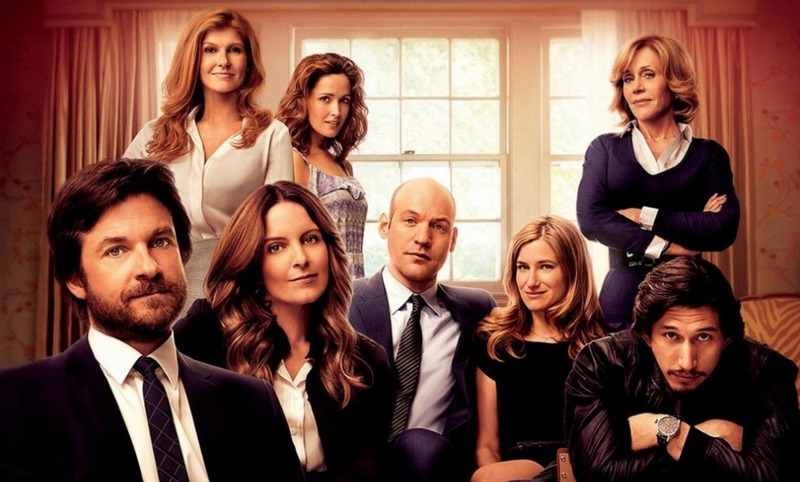 The problem with This Is Where I Leave You is not with its cast, Jason Bateman gives a good performance as the down in the dumps Judd and his chemistry with the rest of the cast is fairly good. Tina Fey tries a more dramatic role on for size and it fits her pretty well, and Adam Driver (What If, Girls) gives the films best performance which shouldn’t really shock anyone considering besides Jane Fonda he may wind up being the films best actor when (and if) you look back on this movie in 20 years. The cast is huge, and they are the thing that helps the audience get attached to them because you really do enjoy most of the performances on screen. The problem with This is Where I Leave You is surprisingly enough in Tropper’s Script. The dialogue is bland and generic, and the film drags to near crawl, with scenes and moments that just don’t belong This Is Where I Leave You almost seems like it was cut together and sent to theaters within a week. Throughout the entire film with every lame joke about a characters nickname or every rehashing of personality problems it seems that Tropper forgot his film had to be like his book but more centered. The author forgets that he has to tell his whole book in under 2 hours so the script sporadically tells the story of Judd as they try to keep everyone else’s screen time equal. The script just doesn’t work, especially everything following a fairly good scene between Tina Fey’s Wendy and Jason Bateman’s Judd, sitting on the roof of their house Wendy tells Judd “You don’t do complicated” referring to the fact that Judd has had his life basically planned out for him since he was young, this line is repeated and rehashed so many times for the rest of the film. Which of course would be fine but the scene begins to mean a heck of a lot less once each character repeats it over and over again. It demeans one of the film’s final scenes between Bateman and another character that is supposed to show Judd’s growth, instead it’s a predictable trailer moment that is only made charming by the actors performing within it. I have nothing against Tropper’s novel which I have heard wonderful things about; sadly those great things don’t seem to transfer to the silver screen. This is Where I Leave You was supposed to be a memorable comedy/drama about family, changing, and the troubles of life, some of those plot points get across but for a movie that puts so many balls in the air it’s disappointing that only few of them get caught. The actors give their best shot to do the most with an average script and busy story and sadly that makes This is Where I Leave You an average at best film. A movie that should have been a relief in the stale comings and goings of late September will ultimately be forgotten by early October, which is a damn shame because it really could have turned into an enjoyable film about family and grief. Starring- Jason Bateman, Tina Fey, Jane Fonda, Adam Driver, Corey Stoll, Kathryn Hahn, Rose Byrne, Connie Britton, Timothy Olyphant, Dax Sheppard, Debra Monk, Abigail Spencer, and Ben Schwartz.